After a week of sweltering heat, the rains are here. We woke up to a rainy Monday morning, not the ideal of weathers to start the week with. I already knew what I was making for lunch, something aromatic and flavorful to beat the blues. 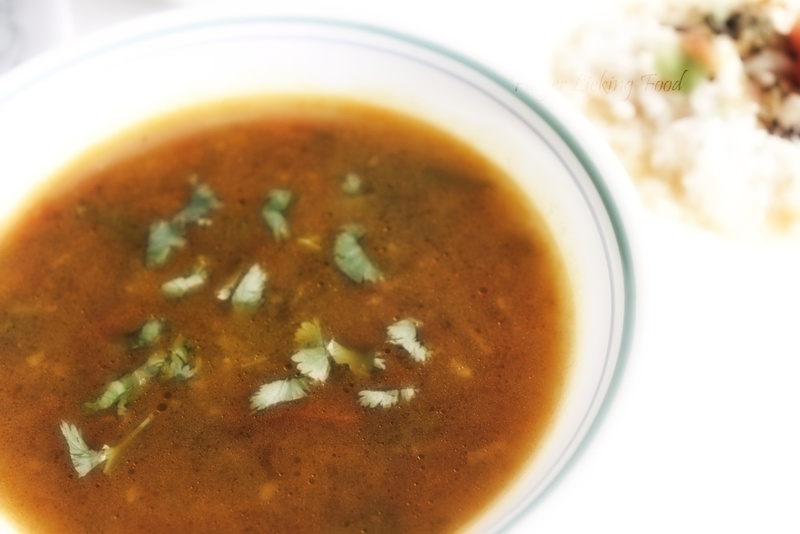 This is a simple rasam and a quick fix to wake up sleeping taste buds. 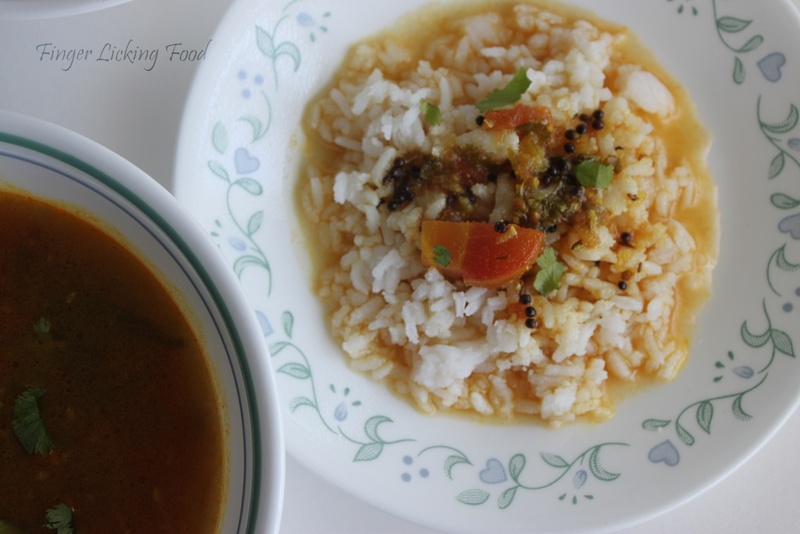 Tomatoes are traditionally boiled when making rasam, but in this recipe I sauté it which gives it a slightly different texture, not too mushy, not too firm. The sautéed garlic adds a ton of flavor too. And the best part, it’s all done in one pot. Heat oil in a deep pan. Add the mustard and cumin seeds. When it splutters add the curry leaves, asafetida and turmeric. Saute for a few seconds and then add the chopped garlic. Cook for a minute or two till garlic is fragrant and is slightly brown, taking care not to burn. Now add the chopped tomatoes and cook for 4-5 minutes. Add the water, tamarind paste and jaggery. Season with salt and bring to a boil on high heat. Once it reaches a boil, reduce heat and simmer for 5 minutes. Turn off heat and garnish with cilantro. Looks yummy!! perfect for a chilly evening!! Anytime comfort food...looks spicy and tasty! Sweltering heat there and I would love to have some warm weather here. Your dish looks and sounds delicious! Very colorful also! wow! 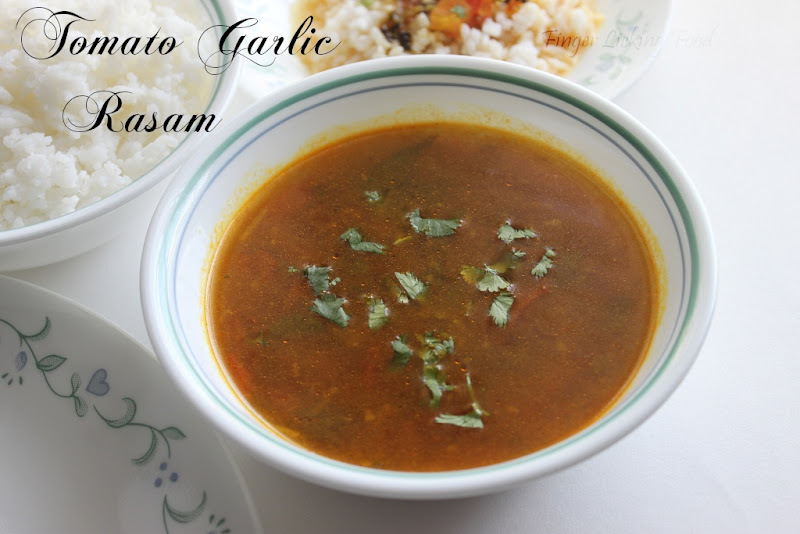 my favourite and delicious rasam. It is okay if I eat with my hands right?